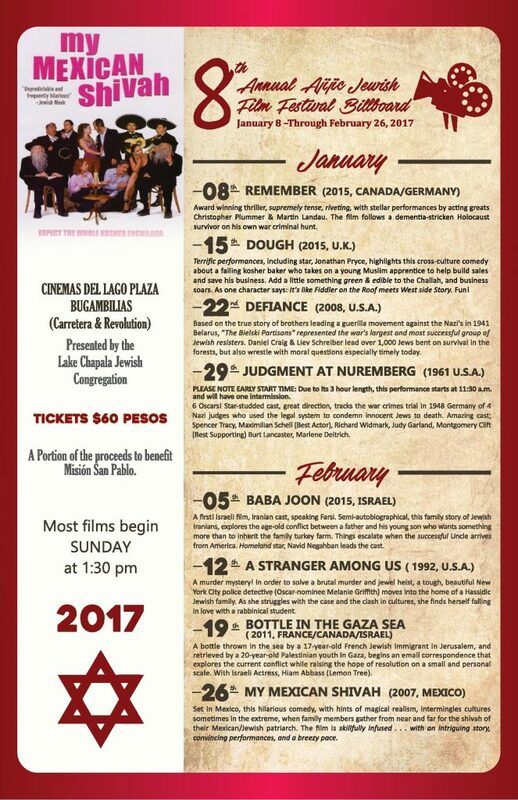 The 2017 8th Annual Jewish Film Festival will feature a film on each of the nine Sundays in January and February. The festival begins on Sunday, January 8 with a 1:30 pm showing of Remember (2015, Canada/Germany) Award winning thriller, supremely tense, riveting, with stellar performances by acting greats Christopher Plummer & Martin Landau. The film follows a dementia-stricken Holocaust survivor on his own war criminal hunt. Terrific performances, including star, Jonathan Pryce, highlights this cross-culture comedy about a failing kosher baker who takes on a young Muslim apprentice to help build sales and save his business. Add a little something green & edible to the Challah, and business soars. As one character says: It’s like Fiddler on the Roof meets West side Story. Fun! Based on the true story of brothers leading a guerilla movement against the Nazi’s in 1941 Belarus, “The Bielski Partisans” represented the war’s largest and most successful group of Jewish resisters. Daniel Craig & Liev Schreiber lead over 1,000 Jews bent on survival in the forests, but also wrestle with moral questions especially timely today. PLEASE NOTE EARLY START TIME: Due to its 3 hour length, this performance starts at 11:30 a.m. and will have one intermission. 6 Oscars! Star-studded cast, great direction, tracks the war crimes trial in 1948 Germany of 4 Nazi judges who used the legal system to condemn innocent Jews to death. Amazing cast; Spencer Tracy, Maximilian Schell (Best Actor), Richard Widmark, Judy Garland, Montgomery Clift (Best Supporting) Burt Lancaster, Marlene Deitrich. A first! Israeli film, Iranian cast, speaking Farsi. Semi-autobiographical, this family story of Jewish Iranians, explores the age-old conflict between a father and his young son who wants something more than to inherit the family turkey farm. Things escalate when the successful Uncle arrives from America. Homeland star, Navid Negahban leads the cast. A murder mystery! In order to solve a brutal murder and jewel heist, a tough, beautiful New York City police detective (Oscar-nominee Melanie Griffith) moves into the home of a Hassidic Jewish family. As she struggles with the case and the clash in cultures, she finds herself falling in love with a rabbinical student. Set in Mexico, this hilarious comedy, with hints of magical realism, intermingles cultures sometimes in the extreme, when family members gather from near and far for the shivah of their Mexican/Jewish patriarch. The film is skillfully infused . . . with an intriguing story, convincing performances, and a breezy pace.